By kind permission of the eternally wonderful Adele at Fox Spirit Publishing, here’s an extract from my novella, Blood Bound. It’s a dirty story of a dirty man, and his clinging wife doesn’t understand. His son is working for the Daily Mail, it’s a steady job – but he wants to be a paperback writer. The first eight words of that summary are correct. 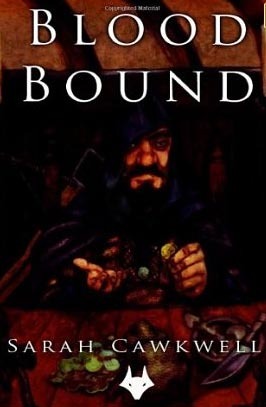 Blood Bound is published by Fox Spirit, with cover art by the depressingly talented Jeff Preston and can be purchased from Amazon in dead tree form, or for the Kindle. Jareth had been in the establishment enough times to know that it would be a heaving mass of bodies later. For now though, apart from his companion, the only other customer was an old man muttering fervently in the corner. From what little snippets of the monologue Jareth could make out, he was talking about some war or other he had fought countless decades ago. It was a low, underlying buzz that was faintly irritating. Jareth considered the benefits of a throwing dagger to the windpipe but then decided it was more trouble than it was worth. Blanking the old man’s mumbling from his mind, Jareth reached for his tankard, taking a long, appreciative pull of the only slightly watered-down ale and considered the shadowed figure sitting opposite him. The offer that had been set before him was intriguing and the mystery surrounding it was all but irresistible to a man of Jareth’s inherent nosiness. He wiped flecks of foam from his lips with the back of a grubby hand and leaned forward conspiratorially. ‘The messenger who set up this meeting told me that you will pay me up front. Is this the truth? I’ve heard such promises before.’ This particular condition had been what had truly piqued his interest and which had led to him agreeing to meet in the inn. As far as Jareth was concerned, this critical point was the fulcrum on which his decision was balanced. Too often he had accepted a job and only received half of the promised payment. ‘Aye, that I will,’ came the reply. The man sitting opposite him was wearing a thick, heavy cloak, the hood drawn up to conceal his features. His accent was strong and difficult to place, although he spoke clearly and carefully. Every syllable fell into place with military precision. He was not a local, that much was obvious. Probably one of the many merchants who travelled through the city regularly. All that was presently visible of him were two emerald-green eyes glittering like jewels in the darkness of his hood. The cloak was fastidiously clean and was made of a rich fabric, dyed a deep, wine red. The style and cut of the garment hinted strongly at underlying wealth. Jareth’s greed had taken in his companion’s fine clothing and had performed an inner dance of glee. ‘Show me the colour of your money then, friend.’ Better sure than conned, Jareth reasoned. After only the slightest of pauses, there was a soft rustle of material and the man produced a cloth bag which he tossed with casual disinterest onto the table. Jareth heard the clink of coin against coin and reached for the lifeline that was being offered to him. As his dirty fist closed around it, the man leaned forward and laid a hand over Jareth’s. ‘You do understand the dangers implicit in this task, don’t you, Master De’roth?’ His voice held a hint of dark promise; a warning that resonated with every carefully-spoken word. Blood Bound is published by Fox Spirit, and can be purchased from Amazon in dead tree form, or for the Kindle. This entry was posted in General, Writing and tagged Blood Bound, Extracts, Fox Spirit. Ordered it last night. After that extract, Mr Postie best hurry up.